Unique stainless steel pick set with stylish ergonomic handles. Handles include serrated finger grips and are some of the most comfortable we’ve seen. 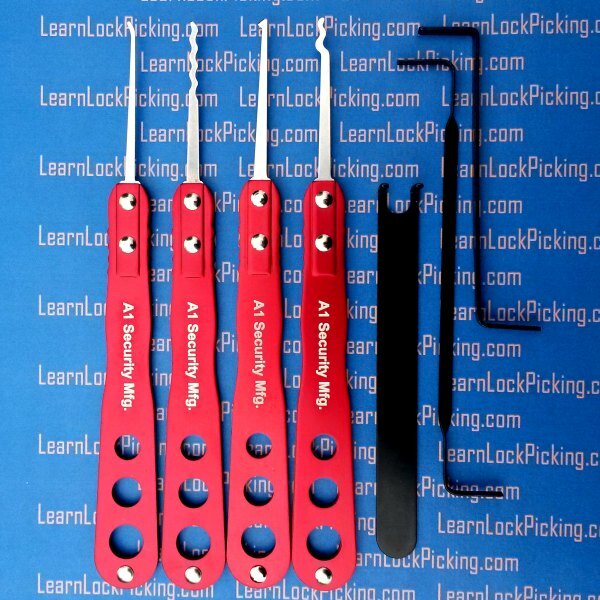 Polished red anodized aluminum handles for a look that is definitely different than the usual pick set. SKU: viperPicks. Category: Lock Picks. Brands: A1. Unique stainless steel lock picks with stylish ergonomic handles. 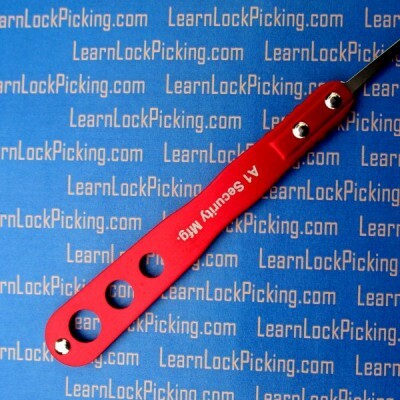 Handles include serrated finger grips and are some of the most comfortable picks we’ve seen. Polished red anodized aluminum handles for a look that is definitely different than the usual pick set. Highly flexible .0196″ blades are thinner than standard picks to allow easier access to challenging key way profiles. Set includes 1 hook pick, 1 standard “c” rake, 1 long rake, 1 half diamond pick, two standard tension wrenches and one spanner type tension wrench. Includes case that can be worn on belt or in shirt pocket. Highly flexible .0196 thick SS blades. Really happy with this kit. Very comfortable in the hand and look the business. I would def buy additional picks if they were available(come on guys!). They aren’t cheap, but I think they represent a good deal. I now have 2 weeks of picking with this set. The frame is lightweight yet sturdy, and the grip is excellent. The feedback on all the picks is excellent – especially the half diamond. It helped me advance my serrated pin skills quickly. This Bogota pick seems to work for me better than other picks. 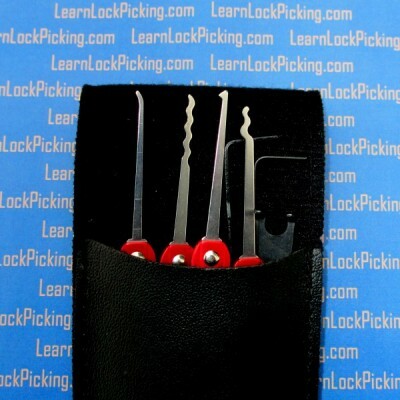 I carry this set in my pocket with the custom 6 pin practice lock on this site to play with when I’m in a waiting room or otherwise killing time. I would definitely recommend this to any level of picker. This is a nice set, in fact pretty awesome, light to use and the rakes are A++++. The picks are equally good to use. This makes a nice addition or a standalone set for field use or bench use. The pick head(s) are securely attached to the base and have a great tactile feeling.The base size is great for it’s broad size is good for feeling what is going on in the lock. I hope they make a few more different picks to add to this set. Very nice and for the price a deal. I have spent the weekend using this new set. I like the light weight and comfortable grip. The Bogota pick is really a nice one and pops open some famous padlocks within seconds.I like the pressure wrenches/ angle lines also; well made and just the right amount of flex. The double headed angle is nice, very nice I hope they make a variety of sizes. Great value for the money.GET ONE!